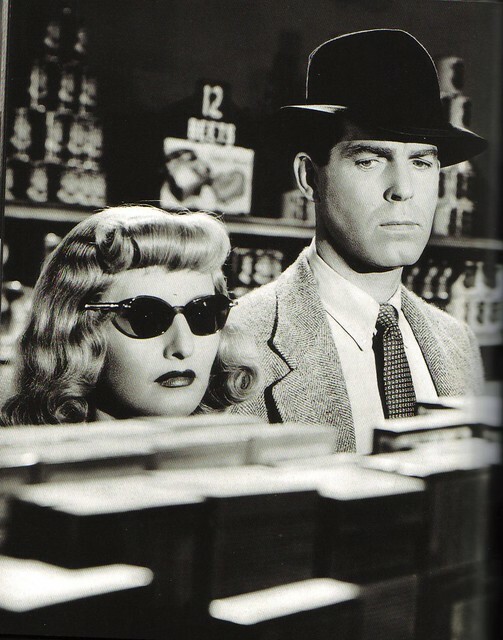 In this photo, Phyllis Dietrichson (Barbara Stanwyck) and Walter Neff (Fred MacMurray) hatch a plot to kill her husband while shopping at the local grocery store in the classic film noir, Double Indemnity (1944). The movie was based on a real murder that was a tabloid sensation in the 1920s. Anyone who's seen Double Indemnity knows that conniving couple Phyllis Dietrichson (Barbara Stanwyck) and Walter Neff (Fred MacMurray) aren't exactly the sharpest tools in the shed. Their plot to murder Phyllis' husband and collect on his life insurance policy falls apart in a spectacular fashion in director Billy Wilder's caustic tale of greed, murder and betrayal. 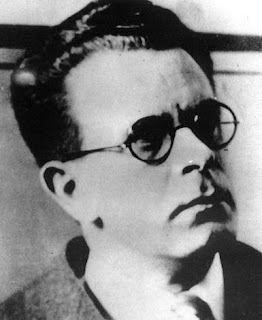 Double Indemnity is based on James M. Cain's 1943 potboiler that took its inspiration from a sensational murder case in the 1920s that the tabloids press dubbed the "dumbbell murder." The murder of Queens resident Albert Snyder by his adulterous wife, Ruth, and her corset salesman boyfriend, Henry "Judd" Gray, was a media sensation. Reporters and photographers packed their 1927 trial to take down every lurid detail for their eager readers. The couple left a large amount of evidence at the crime scene, and it only took a jury 98 minutes to sentence them to death. Their double execution at Sing Sing Prison became one of the top stories of the decade thanks to an intrepid New York Daily News reporter who photographed Snyder in the electric chair. A 1927 photograph of Ruth Snyder. The affair began in 1925 when Snyder was a bored housewife. Albert, who was a magazine editor, was a good provider, but he wasn't like the romantic matinee idols that Snyder watched in the local movie house. In fact, it seems that Albert could be somewhat insensitive, especially about his former fiancee, whom he labelled "the finest woman I have ever met." Snyder made the best of it for awhile -- she and Albert had a daughter, Lorraine -- but she eventually met her Valentino in the shape of Gray, a short, bespectacled corset salesman. The couple met at a Manhattan restaurant and they soon began secretly meeting in hotels, often leaving 9-year-old Lorraine to fend for herself in the lobby. 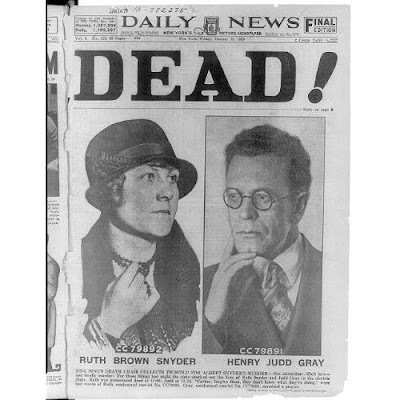 Almost immediately, Snyder began talking about killing Albert so she would be free to marry, but Gray -- who was also married and far less infatuated with Snyder than she was with him -- wanted nothing to do with a murder plot. Snyder did try to kill Albert several times -- she had quite a few bottles of poison with the labels scraped off in her pantry -- but each time Albert ate a hearty supper with no ill effects. A tabloid headline from the day after the execution. Gray finally agreed to get involved after Snyder took out a large life insurance policy that provided double indemnity if Albert died in an unexpected act of violence. Snyder quickly hatched what she believed was a foolproof plot involving a fake robbery, and Gray reluctantly went along. Gray would travel by train to Syracuse where he would establish an alibi. He would then take the train back to Queens, "break-in" to the Snyder's home and dispatch of poor Albert before returning to Syracuse. The plan fell apart when Gray showed up dead drunk on the night of the crime. He tried to use a window sash weight as a blackjack, but his sloppy blows only woke up an enraged Albert. Snyder then took over. Her blows were more effective, and Albert slipped into unconsciousness with the help of some chloroform from Snyder's pantry stockpile. Snyder then strangled her husband with a wire she took off of a painting. Snyder and Gray did a terrible job of staging the burglary, which police picked up on almost as soon as they arrived. The cops quickly found the supposedly stolen jewels under a mattress, and the bottle of chloroform and the all-important insurance policy were spread out on the kitchen table. Snyder's story fell apart when detectives confronted her with Gray's necktie clip, which had fallen off during the struggle. The initials "J.G." were engraved on it, and Snyder snapped, "Judd Gray had nothing to do with this" which led the police straight to Syracuse and a terrified Gray, who quickly blamed Snyder for everything. 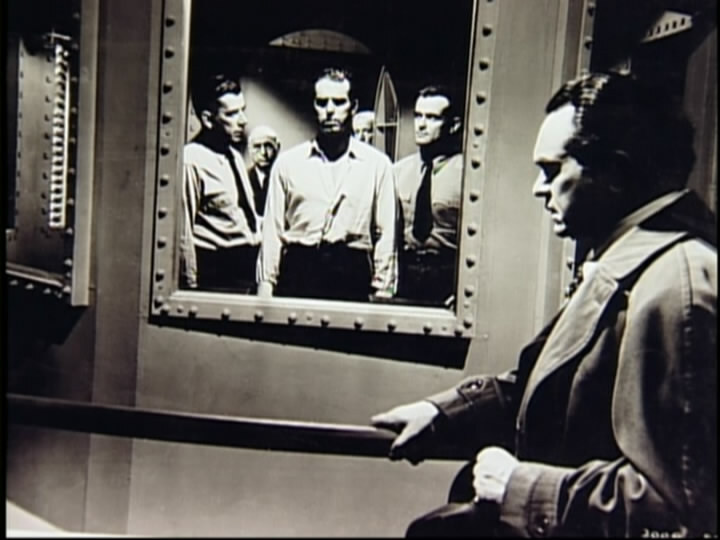 A never-used gas chamber scene in Double Indemnity featuring Fred MacMurray (in the chamber) and Edward G. Robinson (right). The couple's double execution was a major media event with the tabloids providing breathless coverage for weeks ahead of the Jan. 22, 1928, execution date. Gray was taken to the electric chair first, but Snyder's death became a cultural touchstone when Thomas Howard, a reporter for the New York Daily News assigned to cover the execution, sneaked in a camera under his pants' leg. Howard took a picture of Snyder's in the electric chair that was plastered all over the front pages. Not only did it influence many death row movies like I Want to Live (1958) and Angels with Dirty Faces (1938), but it is also echoed in horror movies (the "It's Alive" sequence in Frankenstein). In fact, Double Indemnity originally included a gas chamber scene, but Wilder cut it from the movie because he believed a dialogue scene between MacMurray and co-star Edward G. Robinson provided better closure for the audience.